Bangladesh might be among the last countries you’d consider when planning your next trip, but the longer you look at the opportunities there, the more interesting this rare destination becomes. 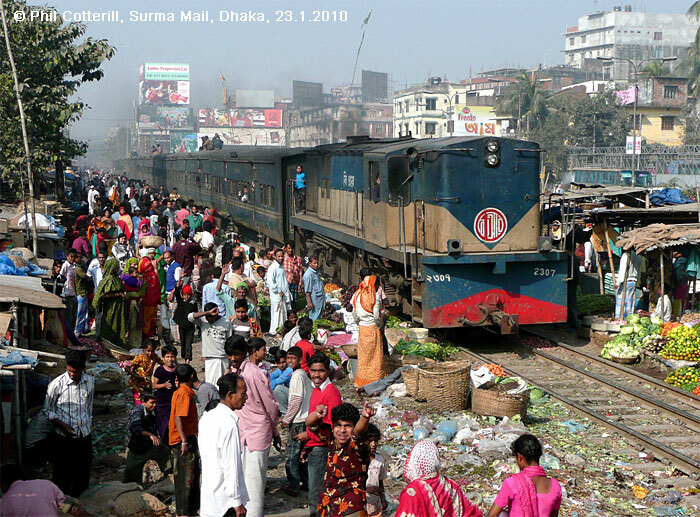 On this tour we’ll combine railway highlights, completely overcrowded trains to the Bishwa Ijtema festival, ship breaking yards near Chittagong and their counterparts, the recycling ship building sites near Dhaka. 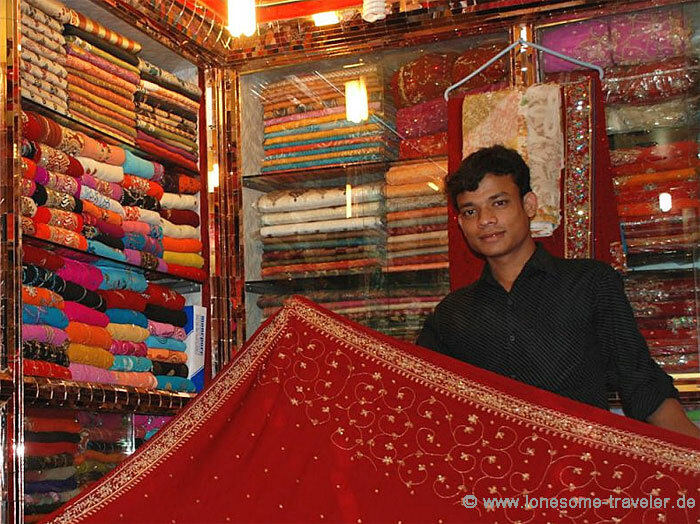 In addition, we’re offering an insight into the fascinating life of Bangladesh, traditional and modern. Bangladesh has the world’s densest population yet also the world’s longest beach at Cox’s Bazar (a developing tourist spot) and the lonely tropical island of St. Martin. There are tea plantations in the highlands, surrounded by lush jungle and small villages of ethnic minorities. Almost cut off from modern society, time stands still in these villages. The face of Bangladesh is colourful: three main rivers, Padma, Meghna and Jamuna and their hundreds of branches, dominate the environment, forming an omnipresent transportation network and finally the world’s largest delta, the Sundarbans. The still large mangrove forests are home to the Bengal tiger, crocodiles, saurian, dears, monitor lizards, eagles and hundred of different birds. Yet, due to climate change and rising water levels, this animal paradise is in danger. While taking a look behind the façade, we’ll have plenty of opportunities for exceptional pictures. We’ll also enjoy the spectacular light at sunrise and sunset. On the railway part of the tour we’ll probably see diesel locomotives from DLW (Varanasi), Alco, Henschel, Hitachi, Hyundai/Rotem, MLW and other manufacturers. Locomotives from English Electric, Ganz (Hungary) are dumped. Very rare are the General Motors class BD 12, built in 1953/54, yet still in use  but might disappear before January 2013. There are a number of old British style semaphores surviving. We’ll also see old style bridges and large colourful markets passed by the railway. 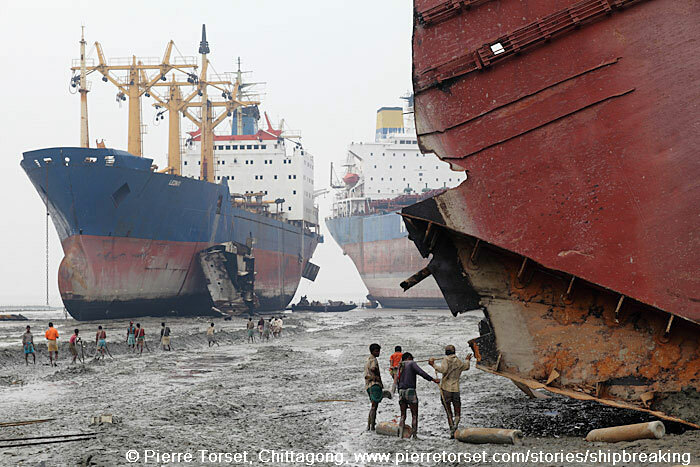 We don’t know if anyone else already offered the Chittagong ship breaking yards for a group of tourists. It’s quite difficult to obtain an official permit. Bad press about working conditions and the environmental impact have caused the officials to become strict. We are under the general description of being journalists. However, negotiations have progressed to the point at which we’re very optimistic of getting access to the ship breaking yards with our photo gear. We’ll see them anyway, but so far it’s not certain how close we can get. Decisions will be made close to the date we arrive. Individual flight to Dhaka. Flight recommendation: Turkish Airlines. Morning by charter bus via Atrai bridge Kaugaon wing to Phulbari station (R585 some 50 km, semaphores), continue via Birampur to Hili (Semaphores), from there linesiding on the road Z5503 to Jaipurhat (market next to the rails) and continue via R550/R545 to the Karotoa bridge. Hotel in Sirajgonj, some 30 km from the Karotoa bridge. The completely overcrowded trains to the Bishwa Ijtema festival are the main reason for going to Bangladesh at this time. We'll take pictures of these trains, where people sit on the roof of the coaches and hang on the handrails of the locomotive. 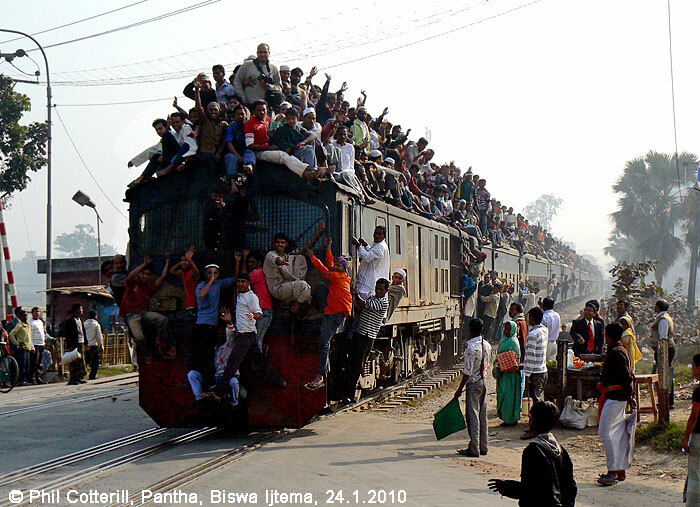 Chasing (as far as possible, traffic jams to be expected) the Bishwa Ijtema trains from Dhaka to Tongi. Pictures from the festival at the Turag River bank. Chasing trains back from the festival to Dhaka. On the third day of the festival we'll have the chance to see overcrowded trains again. 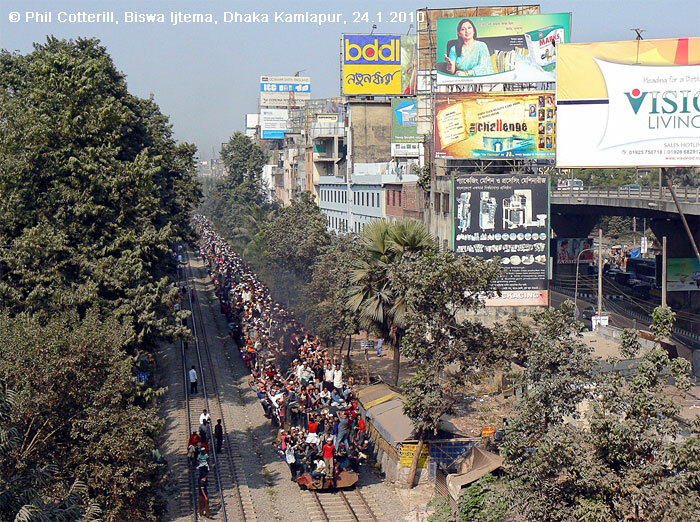 Chasing (as far as possible, traffic jams to be expected) the Bishwa Ijtema trains from Dhaka to Tongi and back. By charter bus to Ghorashal to take pictures of the Moizuddin railway bridge, continue to Narsingdi (railway bridge access: Narsingdi station plus 1mile: west bridge, another 1.5 km walk to the scenic east bridge), continue to Bhairab Bazar for photos of the huge bridge. Hotel in Kumilla, ca. 80 km south of Bhairab Bazar. 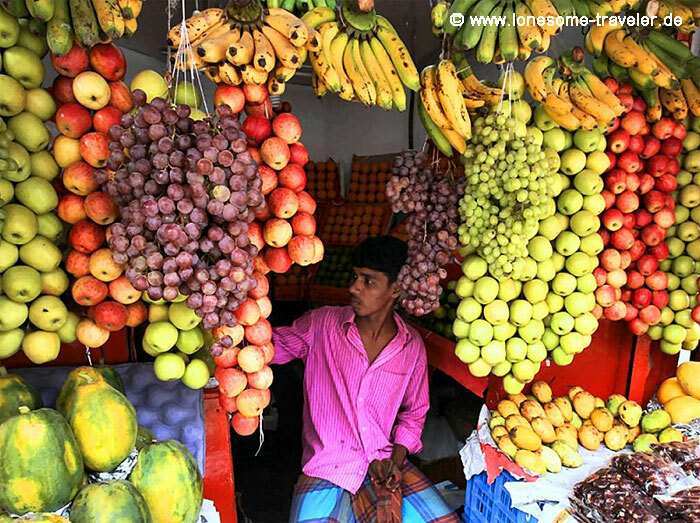 Charter bus to Chittagong via R140, N104, stop at Chaumuhani, street market along the railway to Noakhali. On the way linesiding, Muhuri bridge. Hotel in Chittagong. 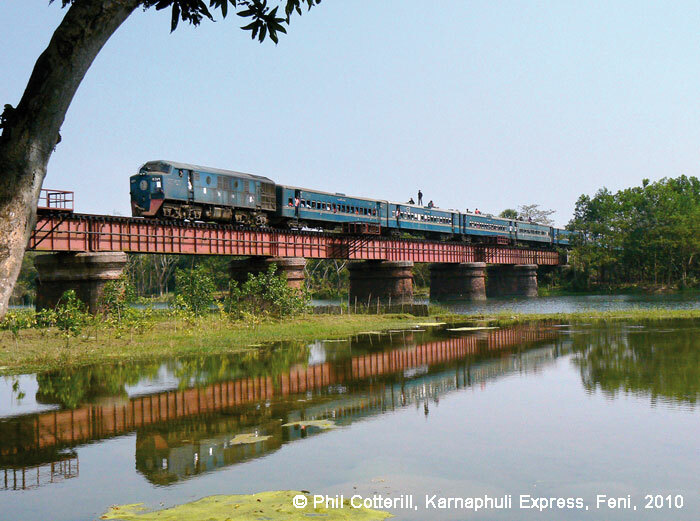 Return by train 701 Subarna express from Chittagong 07.00 to Dhaka, arrival 12.40 hrs. Afternoon visit to ship building company which uses parts from Jahanabad ship wrecking yard. Evening transfer to the airport and return flight. The world’s ship wrecking yards "process" some 700 ships annually. As ships often contain problematic materials such as asbestos, wrecking in developed countries is labour intensive and, hence, expensive. Not so in Bangladesh: wages are low, safety requirements are lower and environmental protection is something for the rich world. The government is therefore restrictive in issuing permits to visitors, especially photographers. We, nevertheless, have good contacts and it seems that we will be allowed in  for a high fee of course. Access to the fenced beaches, guarded by private security firms, is only possible with a permit. If it works out for us  and all indications are that it will  we'll get a unique chance to look behind the facade. Most of the vessels sail under their own power to Chittagong. Here they're driven with full power on to the beach … they call it "beaching". The scrap yards often pay over a million dollars for the right to scrap old ocean liners, hence the guards and the fences. Eager workers remove all usable parts which will find their way to the recycling ship yards. 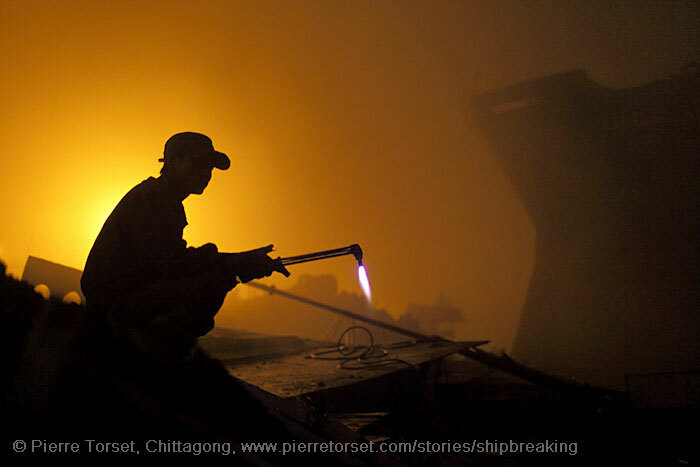 We’ll visit one of these ship builders near Dhaka who uses parts from Chittagong. The scrap value of a ship is enormous. All the metal parts are cut into manageable pieces. 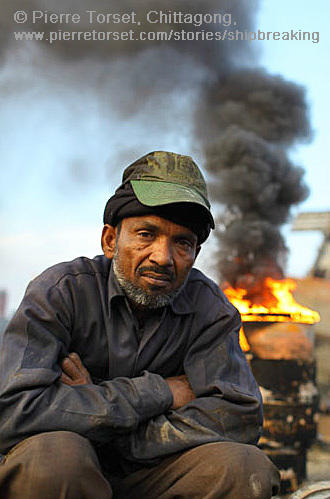 The scrap yards are the only "ore mines" in Bangladesh. Mechanical help is used sparsely; it is more important to create as many jobs as possible for the people, even if these jobs are dubious from a European perspective. Nevertheless, Europeans happily send their ships to Chittagong, knowing how they'll be scrapped. That's why developed countries should not only hold back with their criticism, but rather ask themselves what they're going to do with their scrap. It is their oil, which sinks into the Gulf of Bengal, it is their plastic which is burnt at Chittagong and it is their asbestos which is handled here. Bangladesh Railway covers most parts of this flat country. And the land is mostly flat as a pancake; there are only mountains in the lightly populated border regions with India and Myanmar. Most railway lines don't have visible gradients. They run through palm groves, rice paddies and across rivers. Bangladesh has the largest river delta in the world. The Ganges, Brahmaputra and Meghna pour out here into the Bay of Bengal. The Brahmaputra, "son of Brahma," is divided into a western and an eastern stream. The secondary flow is called Brahmaputra - like in India, but the main stream is the Jamuna. From the confluence with the Ganges, the river is called Padma and where the Meghna confluences the large flow takes over the name of this river. After each monsoon, rivers can quickly change their course. For many years it was impossible to build bridges over the large rivers. Bangladesh's trading and transport was therefore mainly developed on the rivers themselves until the British colonial masters started to build roads and railways. After independence from the United Kingdom the country formed the eastern part of Pakistan (it was called East Pakistan) until in 1971 it became a completely independent state  Bangladesh. Bengali is the official language. Until 2010 railway ferries were important for the country. But in the last ten years a larger number of new bridges have been built, even over the largest rivers in the country. Nevertheless, there are a number of steel bridges remaining from the British period. Some of them are beautiful steel lattice structures and well worth seeing, especially when watching life on the river banks below the bridges. 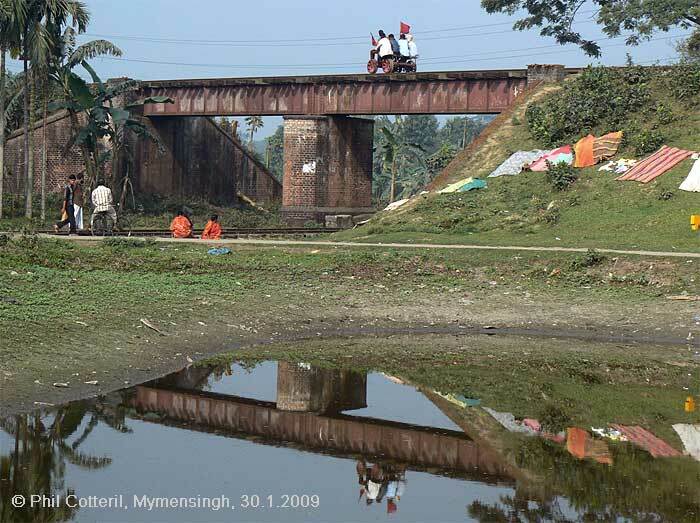 In the western part of Bangladesh the Indian broad gauge (1,676 mm) is the most common gauge while the eastern part is largely covered by metre gauge railways. In between the two systems you'll find lines with dual gauge (tracks with three rails). Travelling by train, especially in the spacious first class, is very pleasant, compared with the daily fight on overcrowded and poorly maintained roads. Mostly, train chasing is not an option, although the trains do not run very fast. Traffic jams and other challenges on the roads might even prevent us from making it to all our planned points of interest. 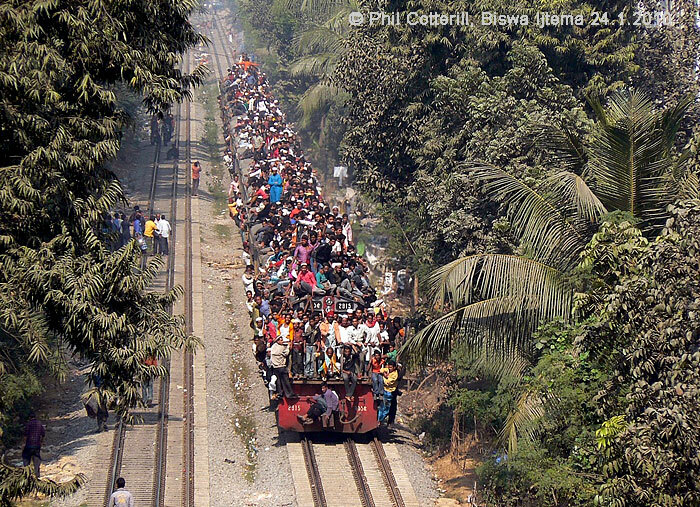 All modes of transportation in Bangladesh are well utilized or overcrowded due to the extreme population density. This applies to buses, ferries and, of course, to the railways. This is something railway photographers like - passengers on the roof and at the handrails of a locomotive. For many people this is the only way to get a "seat". For the Bishwa Ijtema Festival on the Turag River in Tongi, the most important Muslim festival in Dhaka metropolitan area, all the superlatives are blown apart by the overcrowded trains. Especially on the first and last day of the festival the trains are not only jam-packed, it might be possible that you don't even see the train under the crowds riding on it! 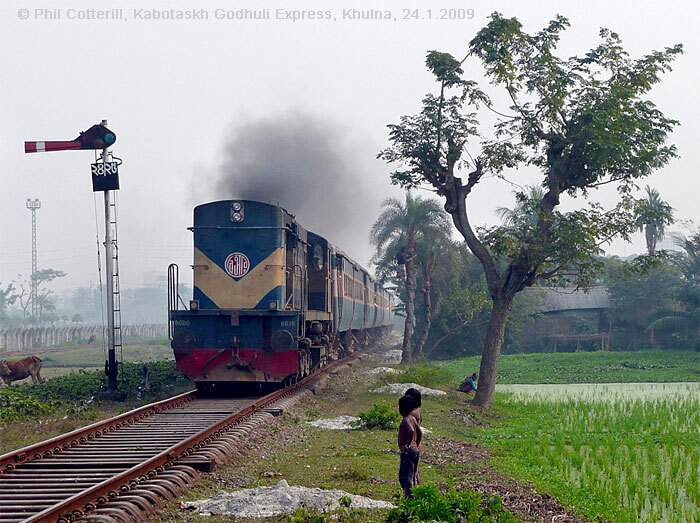 The Bangladesh Railway has about 300 diesel locomotives of different types in stock. In 2012 among them are still a very few General Motors locomotives, built in 1953/54. They have only one cab and are a reason why some of the old British turntables are still in use. The Bangladesh Railway operates a highly informative web site that actually contains the running times of freight trains: http://www.railway.gov.bd/mirrormenu.asp. As poor as the country may be, the railways are a reliable form of transportation which has developed positively in recent years, particularly by building new bridges. You can even buy electronic tickets on the Internet. 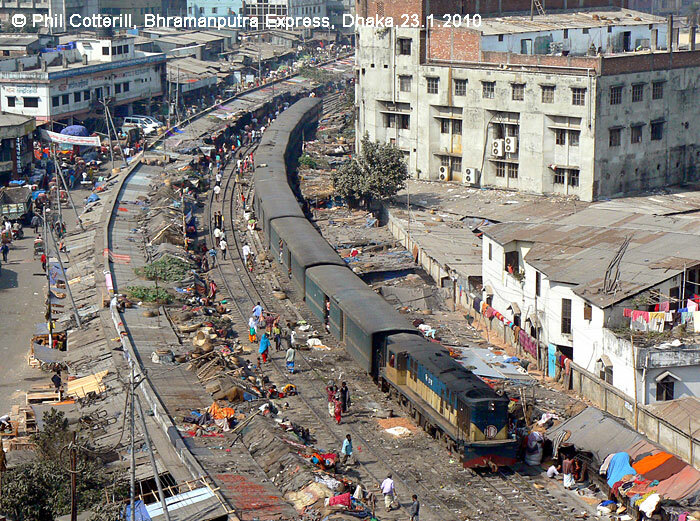 Permits to visit the depots in Dhaka and Chittagong are granted by the state railway. An endearing feature of Bangladesh Railway is the fixed allocation of train guards to a specific train. Since the staff also need to have a day or two off each week, the train remains in the depot. So don’t be surprised by off-days in the schedules that appear to make no sense. Bad news for journalists: The shipyard part of the trip is not suitable for journalists. To obtain the permit we must guarantee that we'll use the footage and pictures only for private purposes. If you wish to participate as a journalist, even privately, we unfortunately must refuse your booking as well - that's the commitment we have with the authorities. For India more or less the same statements as for Bangladesh is valid, although at a much higher level in terms of tourist infrastructure and convenience. The temperatures in Darjeeling are however ten to 15 degrees Centigrade below the temperature we expect for Bangladesh, in the morning it might be below zero! The trip is designed for those who don't hesitate in making the extra effort to get a good picture as well as for those who enjoy what they see without taking pictures all the time. Bangladesh is a poor country by western standards. But this changes abruptly if you order a charter bus in good condition or a descend hotel. Hotel prices then can easily reach and exceed ten or even a hundred times the annual income of a local farmer! You should not be surprised by huge differences in prices for local and tourist services. As soon as you want to have a certain standard and comfort Bangladesh is still not expensive, but it is not cheap either. Bangladesh is a very poor country with an enormous population density, massive environmental problems, severe cyclones with equally severe devastation by floods, a poorly developed infrastructure and accident-prone transport (of which the railway offers the safest mode of transport). So much for the prejudice ... on the other hand Bangladesh has incredibly gracious and helpful people. Even in remote areas, there is always someone who speaks English and will offer help voluntarily. Everywhere you will find traditional farming and fishing, in the cities trade and commerce on the streets seem not to have changed much since the days when the British conquered the country. There are a myriad of impressions and experiences that await you and can't be replaced by reading the latest GEO report or seen on television. To make your trip enjoyable you should follow some rules. Regarding food, the tropical rules apply: cook it, peel it or leave it. Tap water is often not suitable for drinking, ice cubes in drinks should be strictly rejected, because you don't know the quality of water they used to make the ice cubes. The cuisine can be very spicy, you don't need to order an extra chilli, it's in already ... Rice, vegetables and chicken in various styles are the main dishes. We expect temperatures below 30 degrees Centigrade. In the morning it can be around ten degrees Centigrade while the afternoon temperature often reach 25 degrees. The humidity in January reaches only about 40 to 50%. Although some parts of the country are sparsely populated, overall the population density is more than 900 per square kilometre. There are many beggars, and they rely on begging to survive. But you should not think that a bill of a hundred Taka will solve your personal problem with beggars. 100 Taka is about 85 Pence and would invite other beggars to approach you as a rich and generous westerner. It is better to watch what locals donate to beggars before you do it. 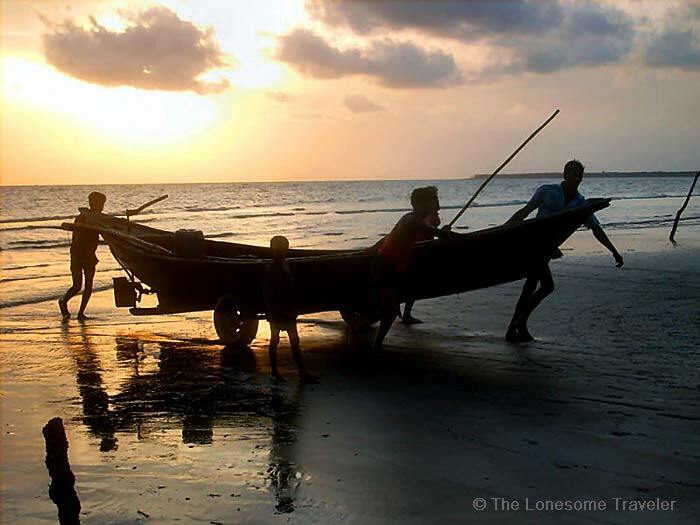 Most locals have no money to give away, so it is usually a very small amount, if any at all. You should neither be hard-hearted nor imitate Mother Teresa. Begging and donating are part of Bangladesh's society  Bangladesh is not a welfare state. While thefts are not very common, they are still there. Especially with the valuables we carry around (and that includes even a simple mobile phone) the temptation may be great … the equivalent of a local one year's salary is easily exceeded. We are travelling in an Islamic country. Militant Islam is not known in Bangladesh. We should simply behave ourselves respectfully and decently, then we'll have no problems and will be treated equally with respect. Anyone who wants to focus on portraits of women: again, we travel to a Muslim country. You will get your desired photos if arranged respectfully and diplomatically, but rarely with a direct attack. Beer and other alcoholic beverages are available in Bangladesh (in India no problem), but usually only in one of the very few state liquor stores. The quality of the premium beer, brewed in Dhaka, is comparable with the worst U.S. standards. It is said that there are significant differences between batches. It's easier if you can survive two weeks without beer. Drinking alcoholic beverages in public is frowned upon by society anyway. Coca Cola on the other hand, is available at almost every corner. Non-Muslim travellers are allowed to import two bottles of wine or whiskey for private use only. Foods, including pork, may be imported for personal use as well, however, no drugs of course. Buy drinking water only in authorised stores, not at street vendors. The bottles could be "refilled". Only with carbonated water can you assume that hygiene standards were followed. Our hotels in the big cities are of a good standard with air conditioning but in the smaller towns we must cope with the best available hotels, which does not mean much. They are clean and have a European toilet. In the regions where we are going to, you do not need malaria prophylaxis. However, mosquitoes transmit other diseases. That's why carrying a mosquito net with you is not a bad idea. Please also use long trousers and shirts (for religious reasons and against mosquitoes). Our charter bus is described to be roadworthy and should have working brakes. However, everything we'll see and use represents the standard of our host country - which will not correspond to the standard in your home country. It will vary widely from European, Australian and North American standards. Accident prevention and environmental protection are poorly developed. You are always responsible for yourselves. Hygienic and environmental standards neither in India nor Bangladesh do not conform to Central European, Australian or North American expectations. Carrying some toiletries in your bag is hence advisable. Please bear in mind that accommodation and transportation falls short of EU/US safety standards. Always use common sense when crossing roads and railway tracks. FarRail Tours and its local partners cannot be held responsible and will not accept any liability whatsoever in the case of any accident or damage. We suggest you take out a comprehensive overseas accident and health insurance policy. Bangladesh may see earthquakes, cyclones and floods. The latter two risks are marginal in January. The money for permits must be paid before we can get hold of them. In the unexpected event that officials refuse the vital paper, the money for the permits is lost completely. The permits for the state railway seem to be sure, but the ship breaking yard permit cannot be guaranteed. You have to live with this risk if you would like to participate in this trip. There is no insurance against it. Bangladesh is not Switzerland. Without a certain pioneering spirit one should not leave the beaten paths of international tourism anyway, if at all leave your home. Life is and will remain dangerous. The risk on such a journey in the group is very manageable, and therefore we offer it. But it is essential that you understand that the mentality of a fully comprehensive insurance is not made for Asia. Western Europeans who even believe in the safety of their money in a bank should move away. In Bangladesh, one has to keep open eyes and ears and make your own decisions. We will take the group far from risks, but we cannot, for example, help each individual over the street just to go shopping in the market on the opposite side of the road. Bangladesh will reward those who can live with a certain level of self-responsibility. We'll be off the beaten track, and hence the experience will be off the main stream. The Price does not include flights. We recommend Turkish Airlines. The flights can be booked by FarRail Tours according to your wishes.